Audiocam is a full music service recording studio specializing in ORIGINAL MUSIC PRODUCTIONS for film and broadcast. Owner Rick Hinkle is a musician, writer, producer, and engineer. Unique music created "to order" for commercials, videos, websites, etc. Audiocam can provide all you need for your on-hold system, including original music beds and in-house talent. Audiocam has 2 rooms suitable for voice-over work and features one of the country's TOP female voice talents, in-house! Audiocam features analog recording with a 24-track Studer 2" tape machine, as well as ProTools. Even your home recording can be made "CD ready." Tape baking and restoration available for older archives. 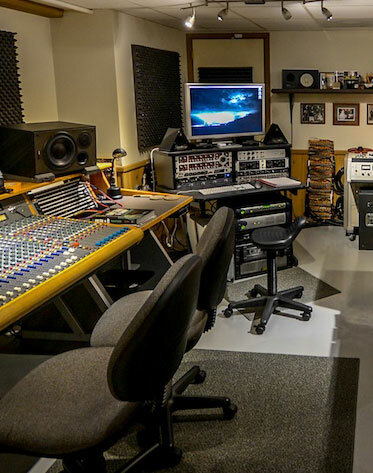 Audiocam's main room is large enough to accommodate a live rhythm section - perfect for original CDs and band demos. Copyright 2013. Rick Hinkle Audiocam Music. All Rights Reserved.